Listening device for MarconiÕs ghost with magnetic field disrupter. Special Features: Crystal Radio Set. Voci Marconia (my translation: waiting for the voice of Marconi) refers to another concept of revisionist history. In it is believed by some that Marconi and his peers thought they may be able to communicate with the afterlife via the new media of radio transmission. The piece incorporates this concept of radio communication by the inclusion of a working crystal radio set that the viewer can tune to the transmissions of Marconi if they have the patience and he really wants to speak with us. The assumption would be that he would be trying, much like the pledge of Houdini, to contact us and could probably optimize his transmission for our crystal set. The set was originally designed to indicate reception on a simple meter that is not shown in the photos. It also included an ear piece for monitoring signals (your favorite am station). The idea that invisible waves surround us becomes the impetus for the remainder of the piece. Like the plumb bob, the radio and these other elements extend our ability to perceive physical reality beyond our senses. The plumb bob in this work (aside from the fact that they fascinate me to the point that I tend to include them every chance I get) is the bottom weight for the antenna that can extends up to sixty feet. The bob is toggle connected to the end of the antenna which, in turn, connects back to the coil of the radio. The small tower in front is a ground touched by the operator while the long arm extended over the coil is actually the tuning device. The plumb bob centers over a compass point mounted from a post on the side of the Magnetic Field Disrupter. 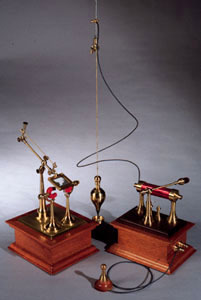 This device manipulates the invisible force of magnetic fields and consists of two rather atypical horseshoe magnets that can be manually rotated and turned, an adjustable iron filing screen that can be raised, lowered, rotated, and tilted in relationship to the magnets, and the compass points. When the magnets are manipulated the changes can be seen in the iron filing screen positioned over them (or between them) and cause the compass point to change orientation and even rotate. Again this device depicts another physical force that we can not see without these perceptual aides. I rather look at the magnetic device as an interlude to the monotony of waiting for Marconi. Something to occupy that other half of my mind and yet formalize the basic things about magnetic fields we all know. Maybe a bit more demonstrative than reflective I can envision the lecturers demonstration that goes with it (or maybe the charlatans) explaining our ability to manipulate magnetic fields and, hence, the departed Marconis obviously easy ability to manipulate radio waves. I have actually used these works in lecturing my own students about objects, process, phenomena, art, and connections and they are often built with the idea of addressing specific issues. I rather relish the notion of creating a vast series of these objects and drawing upon them to illustrate our discussions and wandering concepts. The mysteries of the concepts contained in the works easily hold their attention during the presentation (performance) and after; the original intent of the Philosophical Instrument. These presentations are not something I plan as part of the work but as something that I find entertaining and spontaneous when the mood strikes me. Maybe it is that role of artist as storyteller.